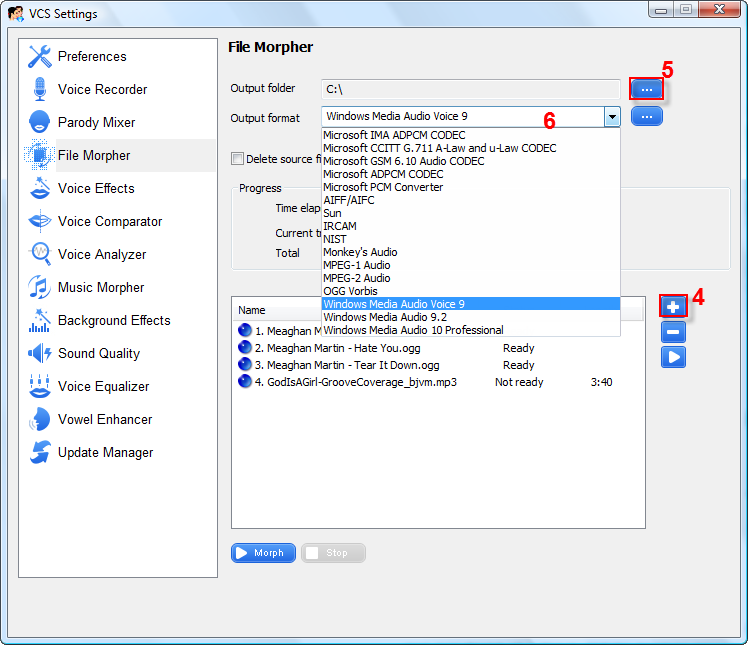 Batch File Morpher is well-known as a great feature of AV Voice Changer Software Diamond for morphing: adding voice effects to multiple pre-recorded audio files at a time and converting them to other audio file format as well . The most brilliant idea of this feature is that you can change any singer's voice to different gender (for example, male to female) at once and on the fly. This tutorial is only applicable for DIAMOND edition of the AV Voice Changer Software product line. 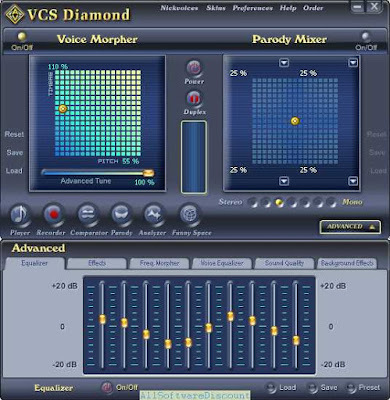 Open Voice Changer Software Diamond 8.0, choose morphing effects for your voice and make adjustments until you are satisfied with the output voice. Note: You should have know how to change voice to different gender, for example, male to female, female to male, using Voice Morpher feature of Voice Changer Software 8.0 Diamond. 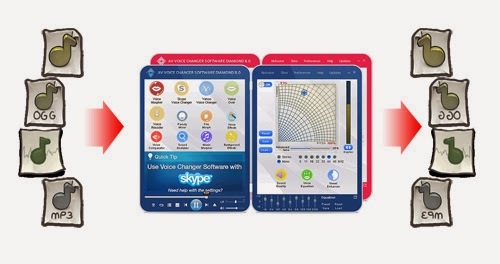 Open the Voice Changer Software 8.0 Diamond program. Listen to the audio file with ready nickvoices selected at Step#1 by opening the files right in the program's player (1)&(2). If you are happy with the voice settings that was made in the above step, then move on. Otherwise, try again with Step#1. 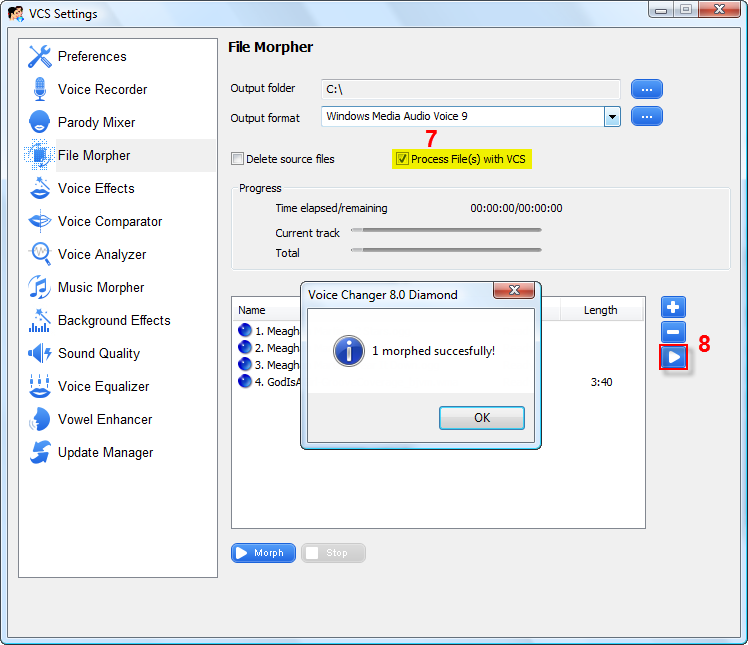 Voice Changer Software 8.0 Diamond comes with built-in player for playing files before morphing in batch. - On the main program panel, click on File Morpher button to open File Morpher feature UI. Use the Add file button (4) to add more files to the queuing list. Or, you can remove those unwanted our of the list with Remove file button. - Location destination for output files (Output folder) to be saved by using the Browse button (5). - Specify Output format (6). - **Enable Process file(s) with VCS (7) option. - Click Morph button to start the files morphing process. After the Morphing finished, you may listen to the result with Play button (8). How do I use a voice changer with Multiplayer? Does anyone know how to do this? 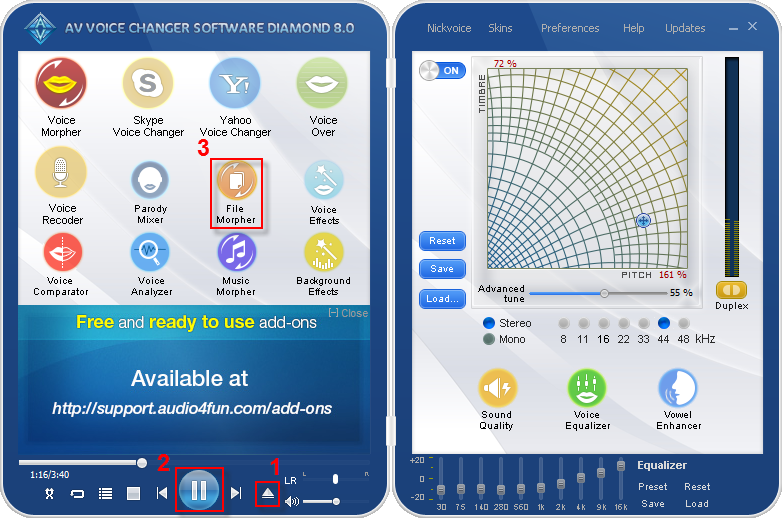 I use Voice changer software diamond 8.0. It ceates a virtual audio driver and for , for game, or for media player classic, VLC, ... just select the virtual audio driver.